There are many technologies can reduce water input in irrigation schemes but many other factors come between technologies and the problems that they can solve. A fast-growing population, expansion of irrigated agriculture, and rapid economic growth have dramatically affected freshwater use in Asia. Urban areas are now competing with irrigated agriculture by demanding an increasing share of the available water for domestic, industrial, and recreational uses. As a result, governments across the continent are diverting freshwater away from irrigation schemes in the countryside to water systems in their cities. The sustainable use of freshwater in agriculture is a growing concern worldwide. More than 2.7 billion people must cope with less water than they need for at least one month every year. Globally, agriculture uses approximately 70% of available freshwater—and 40% of this is used for rice cultivation alone. 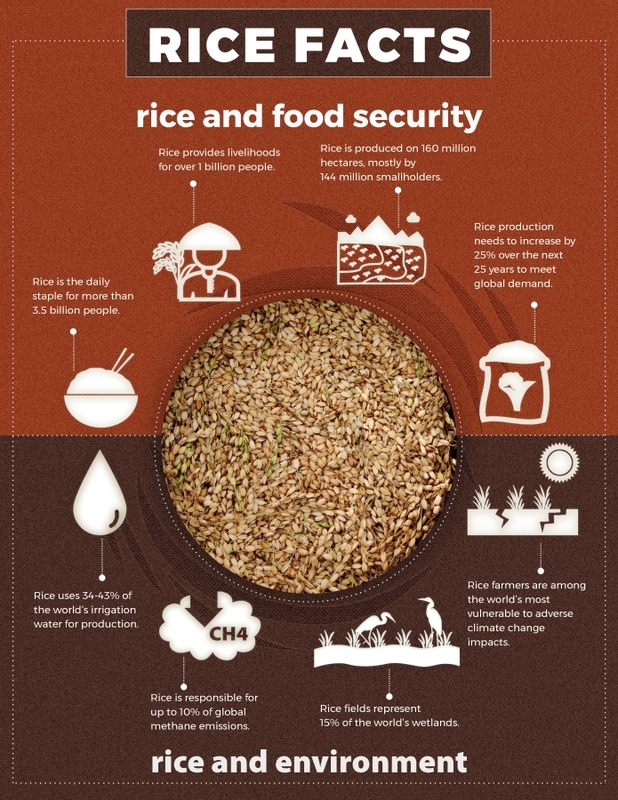 With rice being a staple food for half of humanity, more than 3 billion people rely on this grain for their main source of livelihood. Therefore, enhancing rice production—and looking for ways to grow it with less water—will be essential to ensure food security in Asia, if not the world. In addition to the socioeconomic pressures on the water-food security nexus in Asia, severe changes in climate are already directly affecting the region’s irrigated rice production. Finding ways to use scarce water resources in agriculture more efficiently will help ensure food self-sufficiency and a sufficient water supply for use by both urban and rural areas. Worldwide, the challenge is enormous to produce almost 50% more food by 2030 and to double food production by 2050. A “step change” is required in the ways we approach the water shortage challenge before we can chart a way forward with greater confidence to secure future harvests. The scope of the sustainable management of water resources in agriculture involves the responsibility of water managers and users to ensure that water resources are allocated efficiently and equitably, and used to achieve socially, environmentally, and economically beneficial outcomes. Tremendous scope exists to increase both irrigation water productivity and rice production. Many options exist to greatly increase the quantity of rice grains produced per amount of irrigation water delivered to farmers’ fields—by increasing yield and reducing irrigation input. There is great potential to close the yield gaps between current average yields and yields of the best farmers through the use of existing technologies (i.e., improved varieties and better management). A range of technologies is also available that reduce irrigation input to rice fields without reducing yield. Reducing irrigation input into individual fields can bring many benefits to farmers and consumers alike, such as enabling expansion of the area of irrigated rice during the dry season. Many technologies can reduce water input in irrigation schemes. Examples include alternate wetting and drying (AWD), micro-irrigation, laser land leveling, avoidance of puddling, and short-duration, drought-tolerant rice varieties. However, their adoption has been very slow. It is easy to jump to the conclusion that this lethargy might be because of “free water” policies in Asia. But, in reality, many other factors come between technologies and the problems that they can solve. In the past, most efforts have considered water as a single-facet commodity, for example, irrigation use vs. farmers or irrigation vs. policies or irrigation savings vs. land scale. However, the concept of “sustainable water management” involves considering all processes and stakeholders involved in water management. Gravity-fed/surface irrigation systems have the largest command area in Asia. Water delivery to rice farms involves a complex network of interactions among different stakeholders. The complexity of this system is not only in making decisions on “water quantity” diverted to different areas but also in “coordination” with different stakeholders. Local governments generally inform community-led irrigation associations when the water from the primary canal should be fed into lateral canals. The irrigation associations, in turn, decide when water from lateral canals will be released into an individual turnout (i.e., a contiguous area irrigated through one inlet). Each turnout contains multiple individual fields, all of which are irrigated through one inlet as the water flows from plot to plot. The effectiveness of any water-saving technology is strongly linked to the timely action and decision-making capacity of the stakeholders. Water-use efficiency in many Asian countries is quite low because of many factors, including poor monitoring and coordination of infrastructure. The independent and manual approaches to monitoring and reporting result in knowledge gaps and lapses that hinder proper coordination among stakeholders. The manual approach to water management also results in large losses and significantly longer reaction times by decision makers, which create conflicts and tension among various sectors and communities. AWD is one such water management technique that can save irrigation water up to 30% without a yield penalty. Although AWD technology has been tested in many countries, its adoption has been relatively slow because of several challenges: (a) the water is managed by a farmers’ association instead of by individual farmers, (b) the technology cannot be extrapolated to command areas, and (c) it is knowledge, labor, and time intensive. Allow effective and real-time monitoring of water status at multiple levels (from plot to river basin). Provide improved access to decision-enabling information for different stakeholders. Reduce transaction time and the cost of effective coordination among stakeholders. Enhance transparency in water governance. Create a real-time analytics platform for monitoring, evaluation, and learning. Establish an evidence repository to trigger policy change. Real-time information and management advice on water status and demand are an important aspect of sustainable water use. However, a single-user tool might be helpful for technology introduction but not for actually finding solutions. It is therefore important to understand the potential stakeholders who need to be targeted for improving water-use efficiency. Linking the decision framework into an accessible multi-stakeholder interface can facilitate monitoring and evaluation at multi-scale. Sustainable water management is critical to improving the spatial and temporal distribution of water and leading to increases in productivity and production (particularly in downstream regions) and ultimately contributing to food availability in Asia. 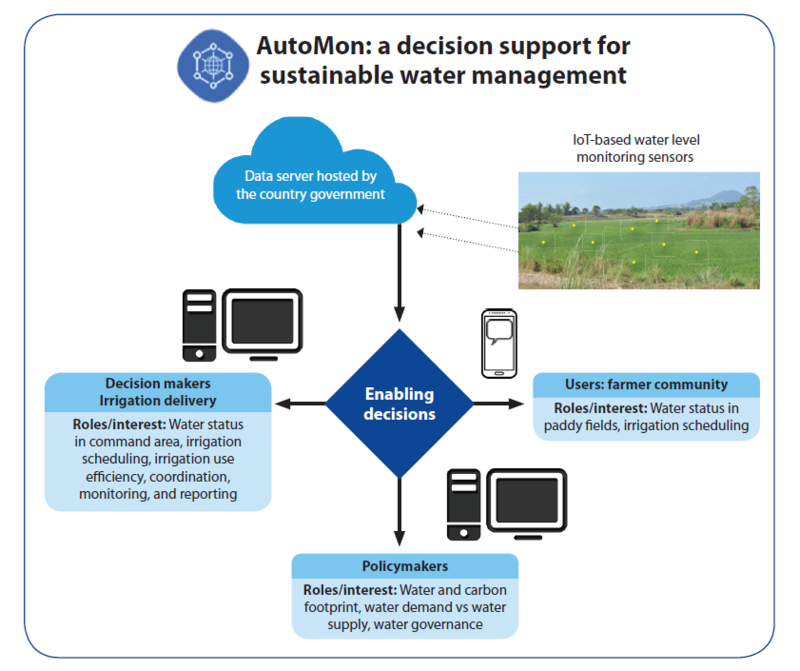 A decision support tool such as AutoMon for monitoring and managing water at various levels can help countries to prioritize the areas that require this scarce resource, which will lead to large commercial and social gains in water-use efficiency aligned with United Nations Sustainable Development Goal 6. The tool can also assist stakeholders engaged in the water management chain in performing their responsibilities more effectively and in a timely manner while bringing in transparency, which is a key pillar of good water governance. Dr. Yadav is a water scientist at IRRI.